For me, writing logs is a very mixed experience. Sometimes a particular subject or theme structures the entry but other times it’s simply a telling of travels for the record. I much prefer writing the former but this log belongs to the second category. It straddles two very distinct events: the citizenship ceremony in the Aztec Great Kiva and the beginning of a new phase in my life, working for the National Park Service. In the immediate aftermath of the ceremony, I am offered a short-term emergency hire position at Aztec Ruins but like bureaucracies the world over, the wheels grind slowly and so we find ourselves with some unspecified number of weeks to fill before the paperwork is complete. We decide to take a holiday until it’s done. First stop is just a place to park up for the night but such locations often reveal unknown treasures. Here it’s a herd of wild horses near the water’s edge, close enough for us to see their interactions, the stallion clearly making his wishes known, the foals suckling off and on. This is Bluewater State Park in New Mexico. It’s the only state we know of that has not hiked its prices through the ceiling over the last few years: we pay $8 to camp down on the beach. The location may be no great shakes but the herd milling around makes it a delight. Our next destination is El Malpais and El Morro National Monuments. We haven’t been here since 2003 during our first full-timing incarnation. The tail end of the monsoon season is still dragging on and a number of trails at El Malpais are inaccessible due to the slick, mud access roads. We settle for a short hike out to the El Calderon cinder cone and move on to El Morro. 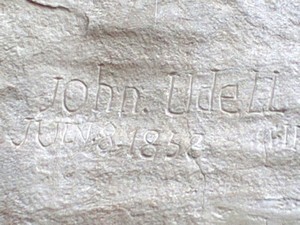 The name of John Udell, carved into Inscription Rock attracted our attention last time we were here but this time round we uncover a real bloodline connection, although a somewhat distant one: John is Sterling’s second cousin five times removed. Sterling’s (first) cousin Tom fills us in on these details along with the fact that the Udells first emigrated to the US, in the seventeenth century, from Exeter in England in the guise of Dr Lionel Udell, physician and inn keeper. So, I may have been born in England but I have no English blood while all along, Sterling’s name turns out to be a reflection of his true origins on his paternal side and I’m sure I’ve started detecting the hint of a Devon accent these last few days. We’re very close to the epicenter of pie at this stage and so have to make the pilgrimage. It’s thirteen years since we’ve been to Pie Town. I have always associated Sterling’s love of pie with him being American but a recent thread on Facebook with my nephew Anthony reveals that he’s also “... a fan of Pies…” and this revelation has made me reconsider whether Sterling’s love may actually be a reflection of his heritage. Having said that, his grandma Edna has some form in the pie-making department so maybe it comes from both sets of genes. Either way, this is the place to go for pies of a heavenly nature. My choice is a blueberry while Sterling goes for the adventurous with a sweet potato, pecan and oat. The blueberry is sublime and has the taste of a touch of rose water although the baker assures me there’s nothing in there but Oregon blueberries and a tiny bit of sugar. A jazz band comprised of aging hippies and cowboys play in the background, locals and tourists mill at the counter choosing from the extensive selection of luscious slices while those at the tables are silent and intent on the serious business at hand. What a great place: the walls are covered in pie-related paraphernalia, the huge cast-iron stove sits waiting in the middle of the room and the atmosphere is extremely upbeat, everyone’s just delighted to be here and we’re no exception. We leave the home of pie heading for Arizona to catch up with friend Dan and his hound, Mable who we have not seen in a long time. We meet for lunch in a small diner in Heber where the walls are covered with umpteen yard sticks. The original, behind the counter is inscribed with the direction “Not to be used for spanking”, the rest have been contributed by customers over the years and there’s very little wall space left. We’re heading further west to a number of small NPS sites that we’ve never visited. 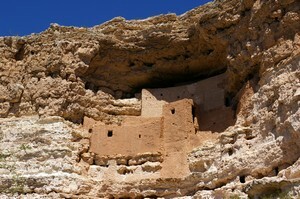 Montezuma Castle National Monument is the first: it houses a cliff dwelling built by the Southern Sinagua people and occupied from about 1100 to 1300. Visitors are no longer allowed up to the structure itself and we must admire and wonder from afar. The museum houses a display of a rather odd timeline parallelling the lifestyle of the local people against contemporaneos milestones in Europe. Developments here are offset against the construction of the Notre-Dame cathedral in Paris for instance, in what feels like an incredibly Eurocentric presentation. The monument has a satellite location: Montezuma Well. 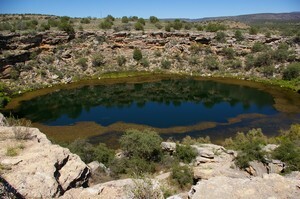 A vividly coloured blue lake, framed with a thin ribbon of pondweed, sits cupped in a limestone sinkhole, in the middle of the desert. It’s fed by continuously flowing springs, is highly carbonated, has a high level of arsenic and is home to five unique species of creature including a water scorpion and a leach. The Southern Sinagua people, influenced by their regional neighbours, the Hohokam canal builders, used the water for irrigating their crops. A little way down the hillside, the water flows out of the rock, in an area of cool dappled sunlight, flowing along the canal channels constructed by the early people. The third site in the group is Tuzigoot National Monument: another Southern Sinagua village that both pre and post dates Montezuma. 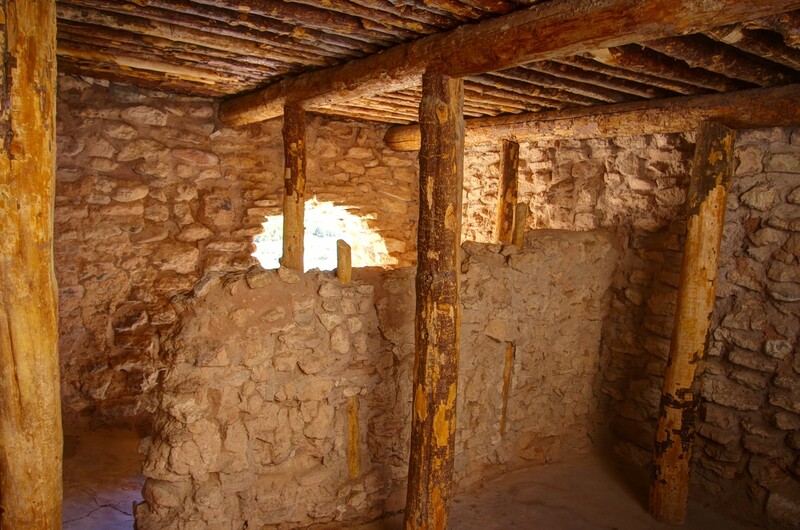 It’s perched on a ridge above the Verde Valley and five rebuilt rooms highlight one of the major construction differences with the Ancestral Pueblo. Here the roofs are underpinned by cross beams supported by tree-trunk pillars allowing for much larger rooms. A very brief stop in Flagstaff gives us a glimpse of this town that we usually bypass on our way elsewhere. 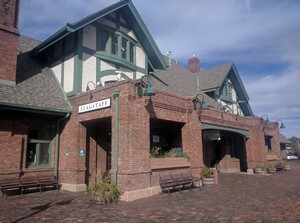 It has an attractive downtown area, a delightful train station, some very good pizza and a number of breweries: the one we sampled had various interesting brews and outdoor seating for a warm early evening. We’ve come to the Flagstaff area to visit two more NPS sites that we haven’t been to for a long time. Sunset Crater National Monument is, as the name suggests, a volcanic site. The richly coloured lichens amongst the jagged edges of the lava fields and occasional bursts of brightly hued flowers against the smooth lines of the cinder slopes are a delight and while the overcast skies make photography of the light-absorbing basalt difficult it’s still a pleasure to be here. The dark local lizards blend perfectly against their backdrop, their evolutionary adaptation making them hard to pick out as they stand stock still, their presence betrayed as they move on our approach. 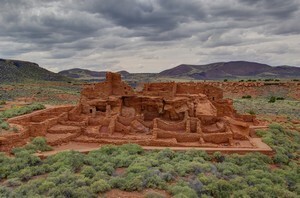 Just down the road is Wupatki National Monument where a mix of cultures appears to have melded, creating a pueblo with a mosaic of features usually associated with distinct groups. It’s not the only place where such cross fertilisation is obvious but to me it’s one of the most interesting. 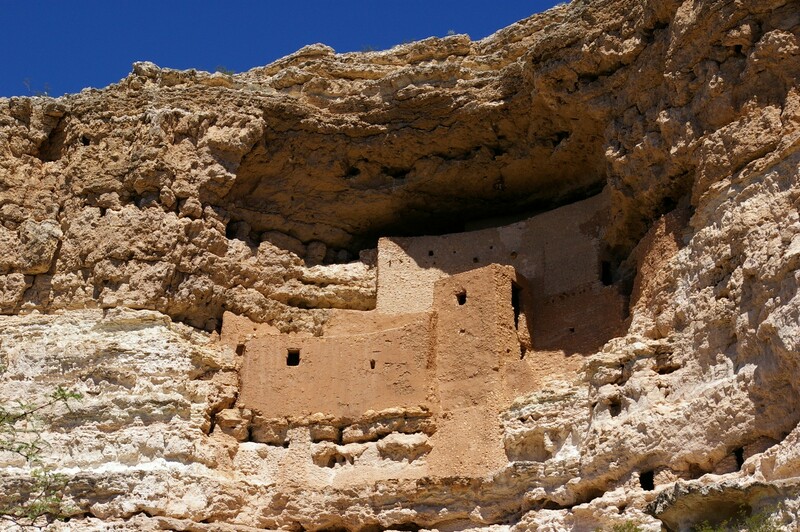 There’s evidence of the Ancestral Pueblo in the T-shaped doorways and the core and veneer masonry, albeit crude, the Mogollon in the ball-court and the Sinagua in the tools, textiles and pottery among the artifacts. 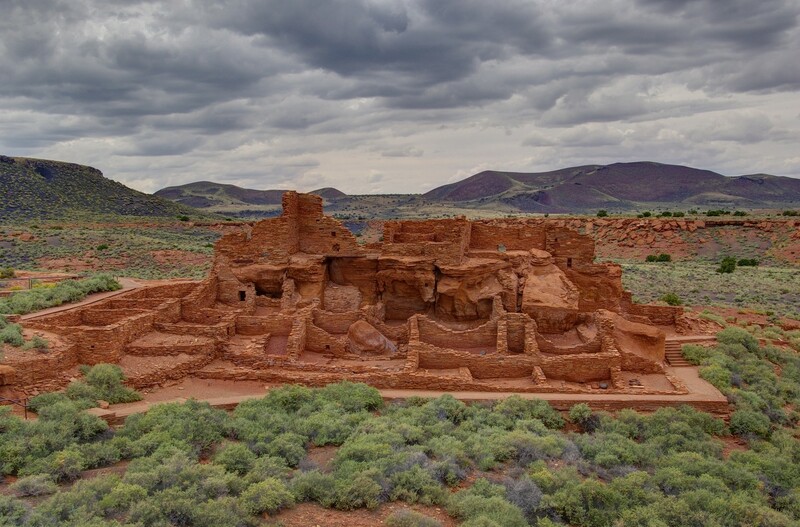 There’s no definite evidence of kivas here which is unusual and what appears to be reminiscent of a great kiva turns out to be an open air community room of some sort. 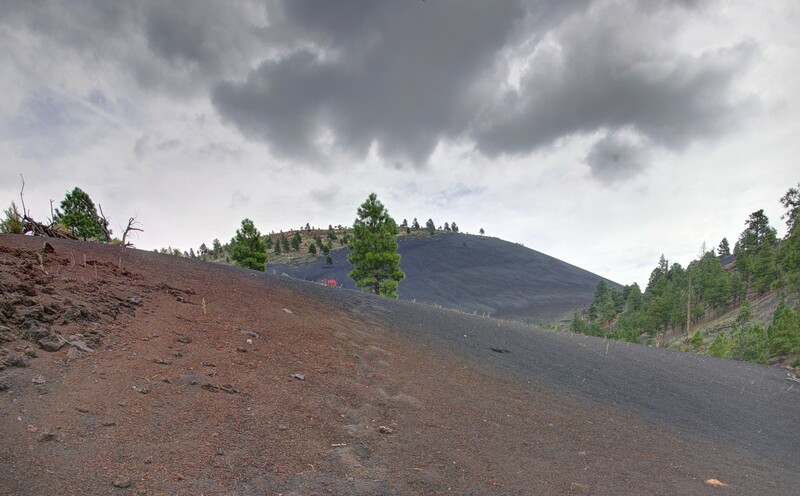 When Sunset Crater erupted sometime in the 1060s it had the effect of displacing people living close by. The lava fields and thick blanket of cinder destroyed the land previously used for cultivation. A little further away however, two to three inches of cinder proved an ideal mulch in the dry climate and probably accounted for the density of people living around Wupatki. Numerous outlying pueblos litter the landscape within a comparatively short distance and while none are as large or complex as the main site, they are a pleasure to explore, particularly as the sky has cleared by the following morning. We’re often under the illusion that we know a particular area fairly well but are frequently proved wrong. In southeastern Utah, where spectacular National Parks are two a penny, it’s easy to overlook some of the smaller locations. Goosenecks State Park is one such place. It’s probably the smallest state park anywhere at just ten acres, and must make more money per square foot than any of Utah’s other parks, due to the day use, which fortunately is confined almost exclusively to one overlook just near the entrance road. The park overlooks a series of tortuous, entrenched meanders far below the canyon rim. At the bottom of the thousand foot stratified walls, the beautiful smooth curves of the San Juan, double back on each other, twisting and turning their goosey way downstream. We park on the rim and the view is stunning whether from the dinette window, the picnic table or our chairs. We sit gazing down to the goosenecks or out across the desert towards the distant rock formations of Monument Valley. It’s a very quiet location overnight until we hear the patter of tiny feet on the roof. We lie listening to it for a while, speculating who it might be: we’ve seen reference to desert rodents on the notice board but nothing more specific. We’re dozing off again when the little chap appears on the fly screen of the vent above the bed: Sterling catches a glimpse of him and shouts to move him on. We close the vents and settle back down until the anguished cry of “Got animals! Got animals!” startles me awake and in my disorientation, it takes me a moment to work out what is going on: Sterling is dreaming that our little friend has found his way in and is on the bed. Fortunately, it is just a dream. A few miles away is another gem of relatively unvisited Utah: Valley of the Gods. A dirt track wends its way through a red rock wonderland of mesas, buttes and stacks. The rich vermillions offset by the deep blue sky, white fluffy clouds, pale sage greens and the masses of yellow rabbitbrush create a delightful scene. From our first overnight stop, we walk some miles along a flat-bottomed wash, an endless feast of interest both near and far. 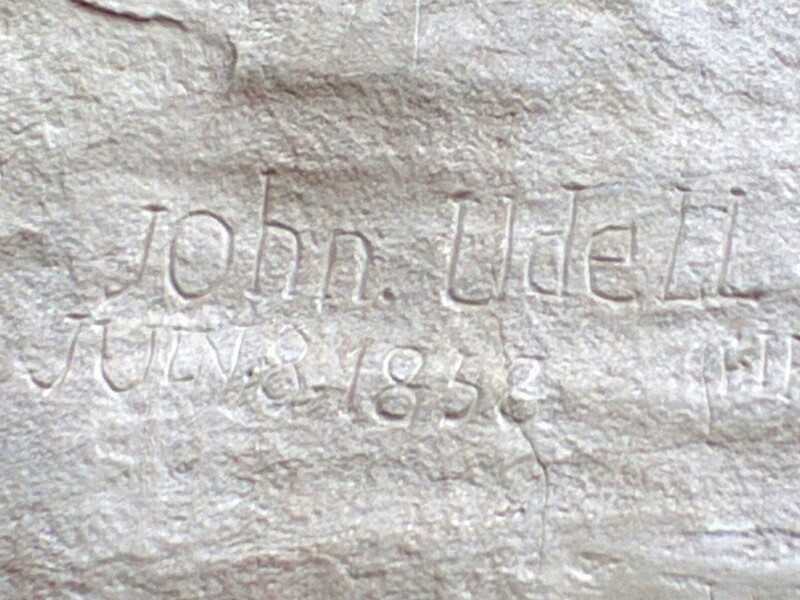 Some fossils catch our attention and in spite of consultation by email with my, 'making no claims to be a geologist these days', sister Solanna, the initial best bet on their identity has to be abandoned once the age of the rock is established. We tootle along a few miles the next day to an even more stunning backdrop and set up for another night. The scale and beauty is hard to absorb, the vistas overwhelming in their splendour. 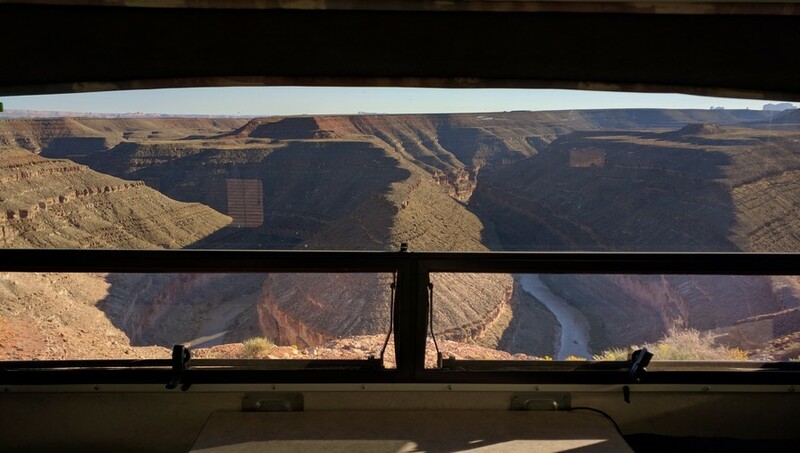 From this second stop the views are magnificent whichever way we look: this is quite possibly the best free camping anywhere and certainly in our experience, which is not insubstantial. We’ll definitely be back but for now must move on as the laundry basket is overflowing and the lack of clean clothes becoming critical. It’s laundry day. 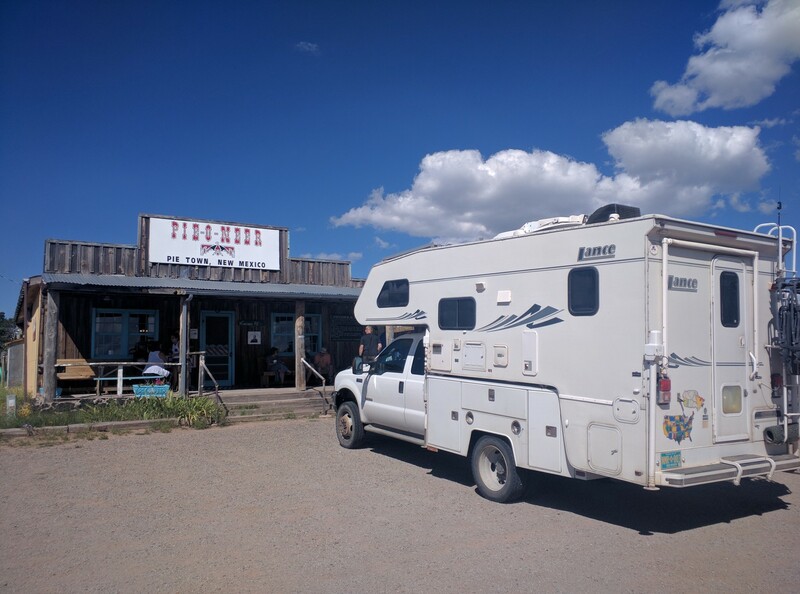 With a camper full of clean clothes we’re heading for The Island in the Sky district of Canyonlands National Park. It’s fifteen years since we’ve been here, having favoured Needles in the interim. Our last visit was a backpacking trip but this time we’re up at the crack of dawn to secure a site at the small Willow Flat campground. It’s so long since we’ve been here that it’s almost like a new park and although the crowds remind us why we don’t come here more often, the scenery and hiking make it worthwhile. Gazing down into the canyons, the eyes find an endless degree of intricacy, complexity and beauty, a little like looking at a fractal, losing oneself for long periods of time in the peace of just being. The secret is to get up and out early in the day or to just be lucky and stumble upon a path with very little parking, like the short White Rim Trail. The views are spectacular and the trail quiet even though the rest of the park is heaving, the car parks full and the overlooks, overcrowded. It’s a fantastic part of the park but I suspect we won’t be back for some time, it’s no mistake that we’ve chosen Needles these last umpteen years. The wheels of bureaucracy are still grinding and I do not yet have a start date for Aztec Ruins. We reason that we should maybe begin to bring our holiday to a close and return to some work. 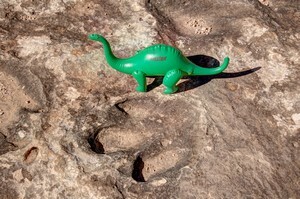 We head out to Klondike Bluffs, not far from Moab to do some work and hike up to see the dinosaur prints. 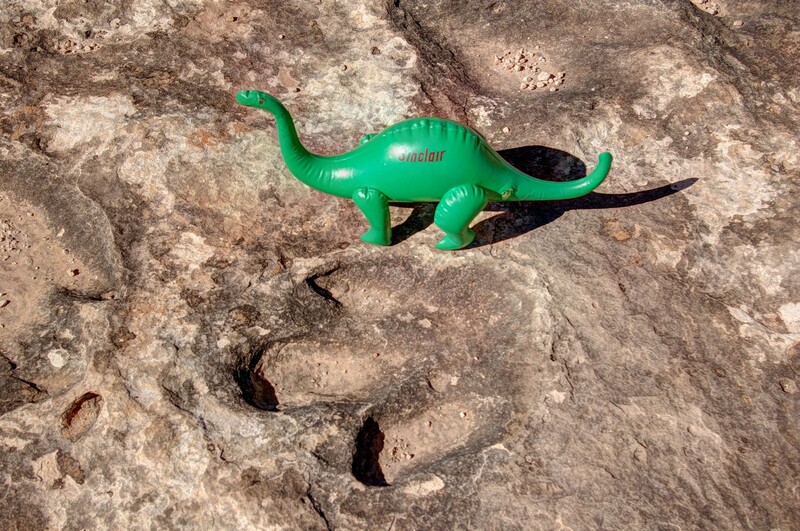 Last time we were here, Sterling was in the aftermath of surgery on his Achilles and so couldn’t make the five and a half mile trek on the Dinosaur Stomping Grounds Trail. This time he’s eager to go and we take his little green friend along to see the footprints of his ancestors. It’s a wonderful hot afternoon with a brisk breeze to temper the heat, wide open views, a large flock of raucous ravens whirling overhead, disturbed by over passing and lengthening shadows as we make our way back to the camper. The last stop on this trip is Ouray, pronounced You-ray, high in the mountains of Colorado. When we were here earlier in the year, the mountains were still blanketed in snow. This time round we leave the heat of summer in the Moab area and arrive in the full throes of a golden coloured autumn. The temperatures are cool, the long trousers back out of the wardrobe and the waterproofs doing their best to protect us from the driving rain, as cloud descends towards the town, swirling around and then hiding the peaks. 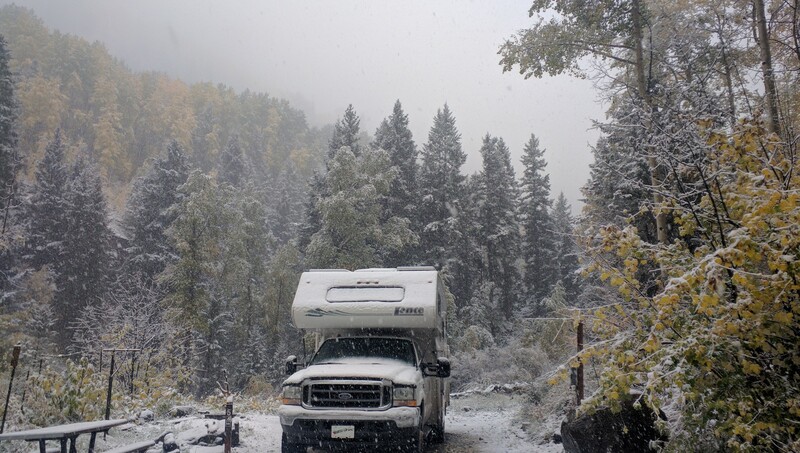 It’s wonderfully atmospheric and as the skies clear intermittently the following day the aspens quiver in their autumn coats and we set up in another stunning location for the last night of the trip. Winter makes its appearance the following morning. The snow is falling and there’s a good inch before we pull out, having to change our plans to go up and over the pass towards Silverton in favour of the longer, safer road near Telluride. We don’t regret it, it’s a magnificent drive and another area we need to return to.